In June 2016, the Joint Task Force on Librarians Competencies for e-Research and Scholarly Communication announced the publication of two Librarians’ Competencies Profiles that were presented at the ElPub2016 Conference in Gottingen, Germany, 7-9 June 2016. There “is an emerging need for a new type of workforce, and existing and emerging staff competencies and skills … several initiatives have looked into specific areas, e.g. Open Science, Research Data Management, Digital Curation, Digital Humanities, eResearch, Data Science,” Text and Data Mining (TDM), etc. (Time to Adopt: Librarians' New Skills and Competency Profiles). 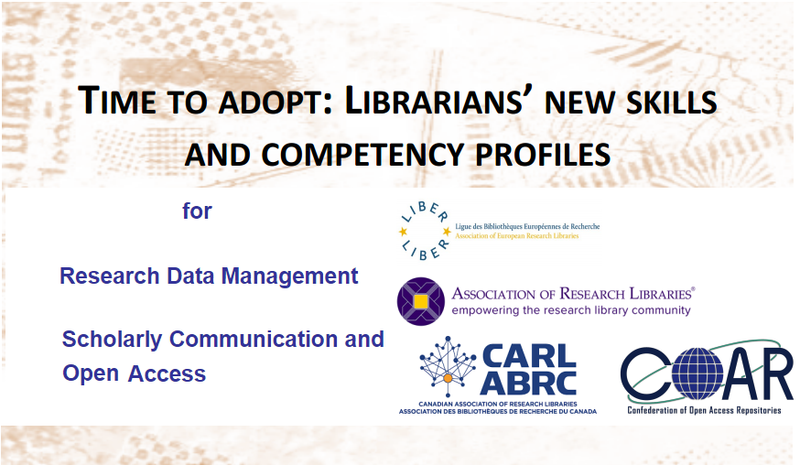 The Association of Research Libraries (ARL), the Canadian Association of Research Libraries (CARL), the Association of European Research Libraries (LIBER), and the Confederation of Open Access Repositories (COAR) have launched the joint Task Force on Librarians’ Competencies in Support of E-Research and Scholarly Communication. The aim of the this Task force is to outline the ToolKit for competencies needed by librarians in the evolving environment of research and scholarly communication. The competency profiles will enable library managers and professionals to identify skill gaps in their institution, to carry out self-assessments, and act as a foundation for the development of training programs. The first step is to identify the various avenues of service for libraries within the context of e-research, repository management (see: COAR Next Generation Repositories Project), and scholarly communication. These services and roles will then be mapped to the competencies required by librarians and library professionals. In addition, the ToolKit will provide an outline of new organizational models that are evolving in this dynamic research and scholarly environment. involves services and infrastructures in order to support the handling of research data across the data lifecycle (i.e. creating/collecting, processing, analyzing, publishing, archiving/preserving, re-using data). which represent a wide area of activities ranging from promoting the institutional data policy, providing support and training, e.g. on how to write a data management plan or how to identify and use data repositories, to develop data curation profiles, and to manage software related to data. Further details on the core competencies needed to cover these areas can be found in the Librarians' Competencies Profile for Research Data Management. involves changing modes of communication of research made possible in the digital environment. Some level of subject knowledge is required in most of these roles. Further details on the core competencies needed to cover these areas can be found in the Librarians' Competencies Profile for Scholarly Communication and Open Access. describes a multidisciplinary research community involving the application of computational methods to humanistic topics of inquiry, or, more broadly, the intersection between the arts and humanities and information technology and/or digital expression. developing and managing spaces (labs, collaboratories) for digital humanities work. Further details on the core competencies needed to cover these areas can be found soon in Librarians’ Competencies for Digital Humanities. Strategies - on how librarians acquire the skills and competencies needed for these evolving and/or well-established service areas - will vary depending on institutional and personnel resources and range from attending workshops or conferences and/or joining working groups, the development of institutional training programs for individuals and/or groups, participation in online learning course (e.g. MOOCs), etc.